Last weekend I was able to dig through some old family keepsakes and documents, and found quite a lot of interesting stuff. 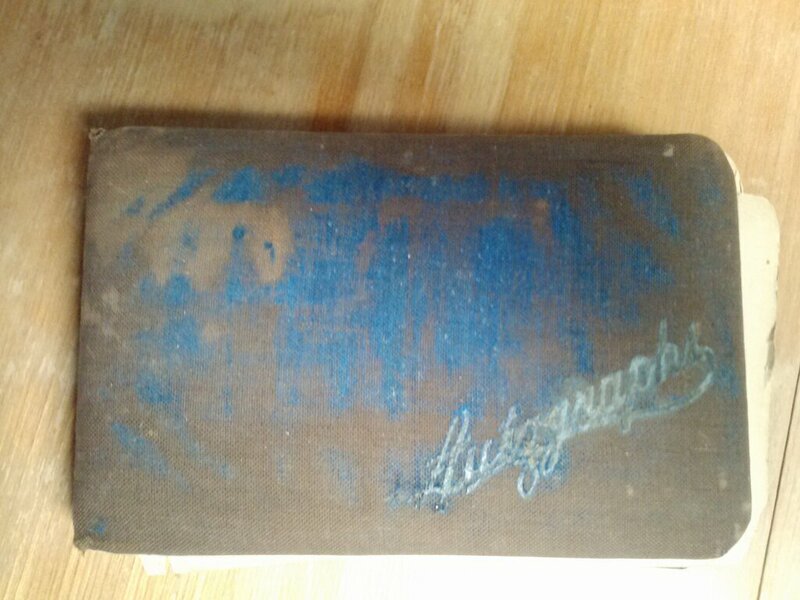 Of particular interest to me was my great-grandmother’s book of autographs, from the late 1800s. These autograph books more or less functioned as the precursor to the yearbook. The inside pages were all blank paper, and friends or colleagues would write little messages to the owner inside. My great-grandmother used hers from roughly ages 14 to 21. Surprisingly, there are a number of short poems written to her by her friends in here. Some are very good. This one, from her friend Mollie in 1888, was particularly good. From which its yearnings cannot save. I don’t think I’ve ever posted this. I don’t know how I feel about it– it’s not a style I’ve employed before, and it’s a little strange. I wrote this poem about a year ago. It doesn’t have a title. Of a fair green land, full of peace and plenty. It lies just behind the sun, on the other side of the rain. It’s people are happy, pleasant, and strange. In the country beyond the rain. So beautiful to break your heart. And strong men dance like long-ago battles. How the King of mountains finally sang. And sat on it children of every race. So you may hear it for yourself. The song of sorrows lost and Desire won. This semester has been busy, else I may have written more. Maybe it was for the best that I have been off the clock, who knows. I made some promises to some people, and then found that people expect people to keep promises that they make to people. Hm. This little limerick, humble as it is, is in celebration of my fiftieth follower, Faith. It is to the tune of a song from a popular children’s movie, and it is about a certain state. You may fill in the blanks as you please. Yet dignified enough to have it’s own couple o’ keys. Even though it’s home to heroes such as Hemingway. As a supped up geriatric state that’s really quite an isthmus! Invite your friends to read my blog– let’s hope for fifty more!